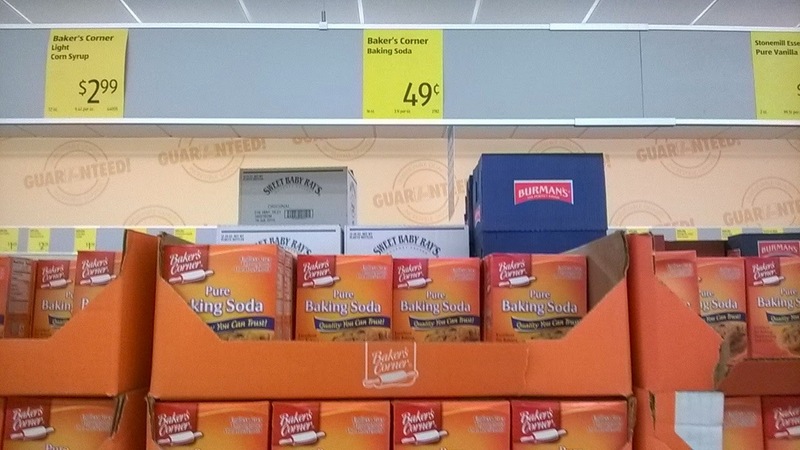 I'm not sure if anyone is brand-loyal when it comes to baking soda, but I have noticed no difference between Aldi's baking soda and Arm and Hammer. The Aldi price for a 16oz. box is $.49 and the online price for the same size for Arm and Hammer is $1.54. I use baking soda not only for baking but I also keep a box in my cleaning supply tub for natural and odorless cleaning. 1. Scour your bathtub - Sprinkle baking soda all over the tub. Using a wet sponge, work the baking soda into a crumbly paste and scrub! In my family we always dye the required dozen hard boiled eggs the day before Easter, but no one in my family gets that excited about Deviled Eggs....especially this year when our traditional Easter brunch was swapped out for a pizza lunch instead. Take out and pizza and deviled eggs don't really go together, do they? I turned my hard boiled eggs into a quick and simple Egg Salad Sandwich. You can also use leftover deviled eggs since most of the ingredients are shared. I may also make Cobb Salad Wraps out of the filling as well for a lunch this week. Directions 1. Using a fork, mash all ingredients together until well incorporated. I'm kind of ashamed to say I had always skipped over the wipes at ALDI because the package was so small (56ct.) compared to the 72 ct. I usually buy. I assumed it wasn't as goopd of a deal due to the package size. I think it's time to do the math and see if buying huge boxes of wipes works out or not? Lullabies Wipes are just as good as any other wipes that I have used and definitely better than some I have tried that are too thin. They are thick, fragrance-free, and alcohol free. Lullabies are packaged with the snap close opening so they work well to throw in the diaper bag or purse, unlike the refill kinds. One package costs $.85 at my store and contains 56 wipes, which works out to 1.5 cents per wipe. Thanks to our recent "release" on Facebook, it was brought to my attention that some people didn't realize ALDI offers USDA organic items! 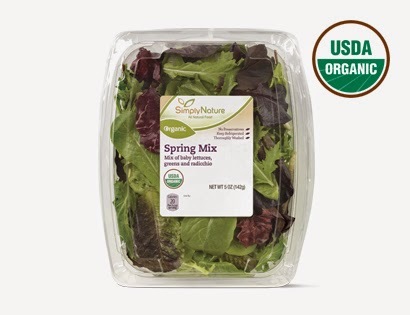 Not too long ago they started offering more organic and "all-natural" items under a line called SimplyNature as well as organic produce. It's worth mentioning that some of these items are limited time offers and not always in stock or offered at every store. I make sure I purchase my favorites when I see them because they may not be there next week. I also like to send the message "This is what I want more of, ALDI!" Directions 1. Boil potatoes and onions in broth until potatoes are fork tender. 2. Add spices and mash until potatoes are in bite-size chunks - don't over mash because they will still break down and you don't want to end up with potato puree! 3. Add cream cheese and stir over low heat until incorporated. Salt to taste. Great side salad for any Mexican dish. If you've never made your own vinaigrette before, you are missing out! It's very affordable, you can go unprocessed, and you can swap out spices and flavors to pair nicely with any dinner. Super simple and delicious full calorie recipe. I used the SimplyNature linguine instead of fettuccine but any thicker noodle works just fine. I am working on a way to"skinny" this one up, but in the meantime, we'll just call it comfort food. Directions 1. Boil linguine according to package directions. 2. In a sauce pan melt butter and saute garlic over medium heat. 3. Add the cream cheese and stir with whisk until incorporated. 4. Slowly add milk until whisking constantly. 5. Stir in Parmesan, salt and pepper and whisk until creamy. If it gets too thick you can add more milk. 6. Strain pasta and toss with Alfredo. Carolyn was making 7-Layer Dip to serve as a snack for when my family was over to hang out last night and I had to write down the recipe as she went. 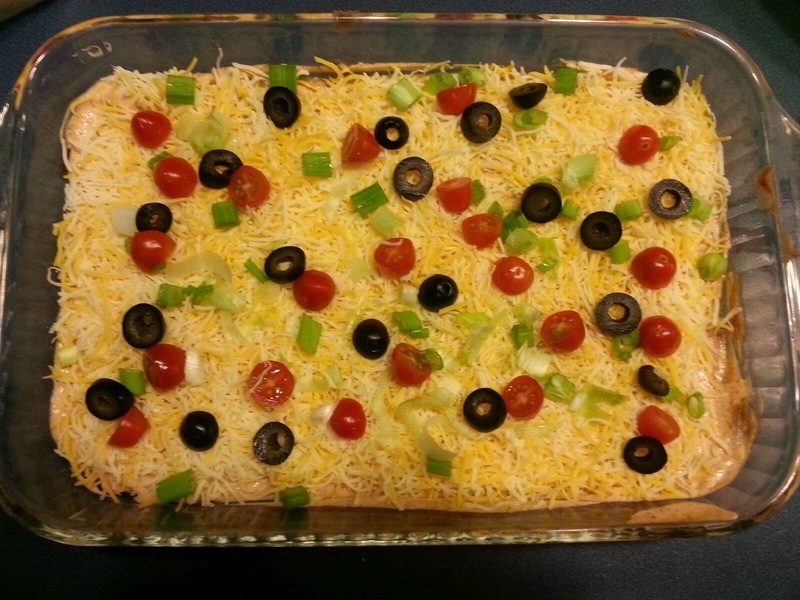 I always assumed 7-Layer Dip was more time consuming than it is? Super easy and quick! Directions 1. On a large platter or 9x13 pan, spread refried beans into an even layer. 2. Spread guacamole over the beans in an even layer. If using a platter, don't go quite to the edge the beans so that the bean layer still shows. I'm not sure whether to call this soup or chili, but it is packed with good veggies and delicious! 1/3 c. chopped fresh or frozen cilantro Directions 1. Place all ingredients except the beans, corn, and cilantro in slow cooker. give it a good stir, and set on low for 8 hours or high for 3-4. If you are leaving it all day, you may want to throw in an extra cup of water. 2. Once quinoa is done, add the beans, corn, and cilantro. Great for potlucks and barbecues! Black Pepper Directions 1. Boil and strain pasta according to package directions. Rinse to cool. 2. 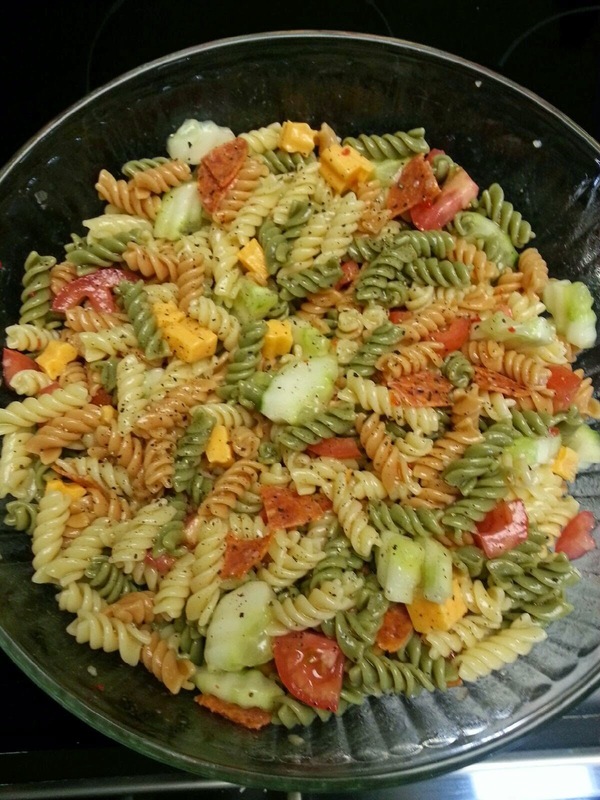 Mix in cucumbers, tomatoes, cheese cubes, pepperoni and toss with dressing and oil. 3. Top with cracked black pepper. Directions 1. In a large skillet melt butter over med-low heat. 2. Spread 1 T. mayo on one piece of bread and 1 T. of pesto on the other slice. 3. Place one piece of cheese in between and grill. 4. Real cheese takes a little longer to melt than singles, so be patient and keep the heat down as not to burn the bread. We have been using the ALDI house brand diapers on our youngest son for the past few months and I would say they are comparable in function to brand name diapers. I don't have issues with leaks or blow outs. The pattern is probably not as cute as some of the big brands, but I figure that my baby is just going to make a mess in it, so function and price are more important than little Bert and Ernie adorning his tush. The biggest drawback of the Lullabies is that they are only available in sizes 3-5. I would guess that this is in keeping with Aldi's business model of only carrying the highest volume items in their store. Directions 1. Cook macaroni in a sauce pan according to package directions. 2. Return macaroni to sauce pan and add cheese and evaporated milk. 3. Cook on medium low heat, stirring constantly until cheese is melted. 4. Season with salt and pepper to taste. *We like to add Season's Choice frozen peas for "Mac n' Cheese n' Peas Please." Directions 1. In sauce pan over medium heat, cook tomatoes, celery, onion, and basil until steaming. 2. With an immersion blender, blend until smooth. (You can also transfer to a traditional blender.) 3. Add milk, salt, and pepper and heat over low heat. *Serve with grilled cheese sandwiches. Freezes nicely in mason jars. Cream Cheese Enchiladas This recipe is very flexible. In the past, I have added shredded zucchini, spinach, or mushrooms. Totally a matter of taste, but the cheese make a great base. Compliments to Emily and Carrie for the beginnings of this one! ProduceCantaloupe $1.29 ea. Strawberries $1.29 ea. Pineapple $1.29 ea. Bananas $.29/lb. Anjou Pears $.99 4pk. Mangoes $.49 ea.